For those who can get to Washington D.C. on November 13, there will be a fragrance event with a chance to meet perfumers Calice Becker, Christopher Diienno, and Heather Sims. The event is open to the public, but you need to RSVP (I will follow up to ask how they want you to RSVP). The event is being put on by the International Fragrance Association North America; they have been working to educate congress about the fragrance industry and the artistry of perfumery. Sounds like the event could be fun! “Ever wondered how classical music, 80’s rock or today’s pop translates into a perfume? 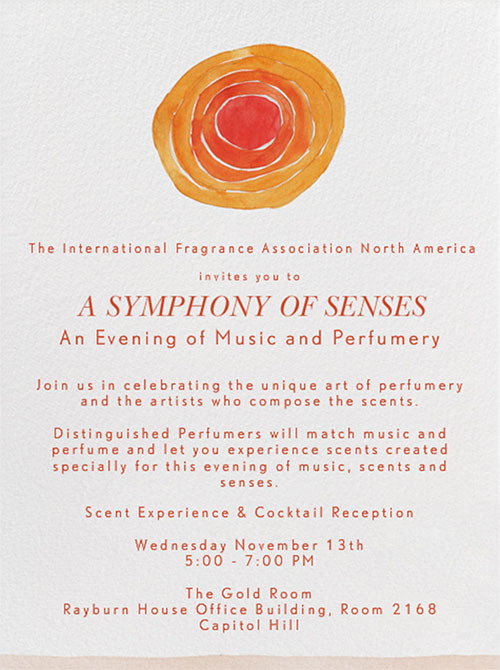 Join award-winning perfumers and the International Fragrance Association, North America (IFRA NA) on November 13th from 5-7 on Capitol Hill to experience these fragrances for yourself, enjoy cocktails and meet the perfumers behind some of the world’s most popular scents. Inspired by music, our perfumers are creating new and unique scents especially for this evening of music, scents, and senses. Perfumer Calice Becker has designed the scent representing classical music. Calice has been the nose behind some of the biggest perfume blockbusters of the past two decades, including Christian Dior’s J’Adore and Tommy Hilfiger’s Tommy Girl. Perfumer Christopher Diienno used Depeche Mode, New Order and The Cure as the inspiration to create a scent representing 1980’s rock and perfumer Heather Sims has created a scent to correspond with Justin Timberlake’s recent Suit and Tie album. Editing to add an update: This event was covered by Mark at Cafleurebon, who attended. Several articles have been published recently about a relatively new technology for creating perfumery ingredients (as well as flavorings and some drugs); yeast, fungi, and bacteria can be genetically altered so that they synthesize perfumery ingredients such as vanillin. Although the yeast is a GMO substance, the ingredient it synthesizes is not GMO and is currently considered to be “natural” in the USA and Europe, though there are some challenges to that claim and we’ll have to see what happens. One stated advantage to this new technology is potentially lower costs for ingredients and therefore the possibility for better formulas to reach the mass market by making natural ingredients more affordable. Another possible advantage would be saving natural resources like sandalwood by synthesizing them instead of harvesting them from nature. Disadvantages include putting some farmers out of business since it would be difficult to compete with the lower prices offered by biotech ingredients. You also have to wonder whether it is wise to create more GMO organisms given the problems we’ve encountered in the past with them, though these micro-organisms would be used in the lab and not introduced into the world the way GMO crops have been. This is likely to be a thorny hot topic in the future. For more information, see the NYT article “What’s That Smell? Exotic Scents Made From Re-Engineered Yeast” and also see the article titled “Biotechnology Ushers in a New Era of Innovation for Perfumers and Flavorists” by Carolyn Fritz in the November 2013 issue of Perfumer & Flavorist. The NYT article explains the overall topic in lay terms, and the P&F article explains more of the chemistry and science behind the technology. I don’t know enough about this topic to make judgments yet, but I couldn’t help having a gut reaction to the lament about today’s poor mass market formulas. Artisan perfumers have been using expensive natural ingredients for years — we do use rose, jasmine, osmanthus and violet leaf absolutes, natural sandalwood oil, natural vanilla absolute, etc. We put the money into the juice rather than packaging, advertising, and celebrity endorsements. We operate on crazy budgets, doing as much as we can ourselves so that every possible dollar can go into the juice. Maybe the answer to the poor quality of mass market juice is not just to look for ways to lower the cost of ingredients but to also change the emphasis from the packaging and advertising to the juice. Artisan brands may put a larger dent into the market in the future because there are now so many of us. Each artisan can only make so many bottles, but together we create quite a lot. I suppose what we do is not significant compared to the quantity of mass market juice, but one can dream that together we are making a difference by offering more options. I wanted to check in with a little update. My arm is doing quite a bit better. It’s not up to normal strength, but my flexibility has improved and I’m able to use it for light tasks now. I’d like to get back to some blending this weekend. I’m taking a few orders via email, but I’m still limiting them until I’m fully up and running. I’d like to put the cart up in time for the holidays. Victoria posted a review of Spiced Citrus Vetiver on EauMG a couple days ago. Thanks, Victoria! I agree with your comments about the naturals vs synthetics issue. Like you, I enjoy both mixed media and all-natural scents, and I am disappointed when brands intentionally advertise as all-natural when they are not. Sonoma Scent Studio had a mention in the October issue of Perfumer & Flavorist Magazine in an article by Amy Marks-McGee titled “Forward Thinking: Crafting Beauty With Nature’s Resources.” The article discusses the trend toward using more naturals in fine fragrance and skincare, with a surge in indie brands that place an emphasis on naturals. Amy mentioned some newer indie brands that focus entirely on naturals and brands like mine that recently dedicated a separate line to all-natural formulas. Amy had authored a previous article several years ago that mentioned this trend (“Forward Thinking: Au Natural,” in the October 2011 issue of Perfumer & Flavorist), and the trend continues to pick up steam. Amy has a website for those who want more information about her business. Since I have time on my break, I decided to start a little tincturing project with New Zealand beach-collected ambergris. I bought a couple of pieces, two grams each, and I purchased an automatic stirrer to run a few hours each day. It will take quite a few months (2-6) before I’ll know if I like the result. I bought one type called White Gold (pictured above) and another type called Antique. The Antique smells softer and less animalic; it is subtly sweet with a dusty incense note. The White Gold seems a bit stronger and has a noticeable animalic note. I’m trying 10% tinctures, which is indulgent for such an expensive ingredient, but I want them to be strong. I’ve smelled 1% and 3% tinctures for sale that seemed weaker than I want. The magnetic stir machines are ingenious. You put a little stir rod into your bottle (the rod looks like a medicine capsule), and then you turn on the base unit that looks like a hot plate and the bar inside your bottle starts to twirl. Some of the units combine a hot plate with the magnetic stirring, and others just have the stir option. They’re useful for tinctures that benefit from hours of gentle stirring. We’ll see how these turn out! 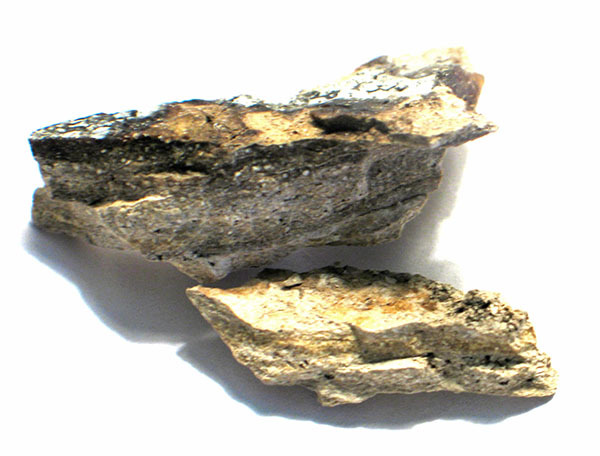 If one is good I could buy more ambergris. I wouldn’t use it in many formulas, but it can add a beautiful effect to a special offering. I wanted to check in — I’ve been taking time off while healing my arm, but I’m here if you need to email me. I’m looking forward to getting back to blending as soon as I can. The Purple Paper Planes blog just started a special series today on perceptions about beauty; various people in the perfume world are answering seven questions about how we define and experience beauty. It will be interesting to see the range of answers. Today one of my favorite bloggers, Suzanne of Suzanne’s Perfume Journal, gave her responses to the questions. I was asked to participate in the series and will let you know when my answers are posted (I already turned them in). I wonder how you would answer the questions! I thought this was an interesting story: Elle, Cosmo, and Marie Claire will distribute two vial samples of liquid perfume in the November issues (not in the magazines on newsstands, but just the magazines mailed to subscribers). They say it’s the first time vials have gone out with magazines instead of just paper strip samples. The samples will be Marc Jacobs Daisy and Daisy Eau So Fresh, which seems like an odd choice, especially for November. I’m guessing they’ll need to send the mags ORM-D surface mail because of the alcohol. I’ll be curious to see if they deem this experiment to be successful. Maybe they’ll become more adventurous with their sample choices over time; I’d think that new releases might be included in this type of campaign.